If you have "special eyes," you know how difficult it can be to wear contact lenses. You know that your doctor will never have a lens in the office that works for you. You know that if you need to change brands for some reason it may take multiple visits and special orders to find something that works. And you also know that you probably won't see as clearly in contact lenses as you do in glasses. These are the hard truths for patients that don't fit in the "average" power-options that most soft contact lens companies provide. For many patients with high or irregular astigmatism, finding a soft contact lens option that provides comfort, vision, and stability on the eye is like the proverbial needle in a haystack. Your best bet is to find a doctor in your area that is willing to think outside the box (and they will have to, believe me). There is no one contact lens that works on every single patient, and that is why fitting contact lenses can be so challenging. Here is a collection of soft astigmatism contact lenses for those patients with "special eyes" that provide alternatives to the standard fitting-set lenses in the office. Frequency 55 Toric XR and Proclear Toric XR: Cooper's extended range lenses perform well on patients with regular corneas that need a little extra cyl. There are 2 base curve options for both lenses, but the diameter is large at 14.4 which poses problems for patients with smaller corneal diameter. I find these lenses to be a good starting place because they are still cost effective and have a pretty fast turn-around time compared to custom lens options (as long as they aren't on backorder). 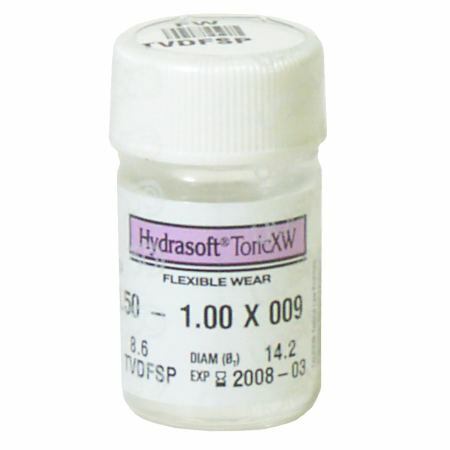 Hydrasoft Toric: For more challenging prescriptions, Cooper also makes this vial lens for quarterly replacement wear. There are base curve options ranging from 8.3 to 8.9 and power options with a wide range of cylinder and myopic or hyperopic Rx. You can also get the smaller diameter 14.2 lens option. Drawbacks? Vial lenses are one of the least healthy options for any patient, and we have continued to see vial lens options get discontinued by companies since they are rather archaic technology. In extreme Rxes, vial lenses may be the only option to get a particular Rx in a soft contact lens, however. 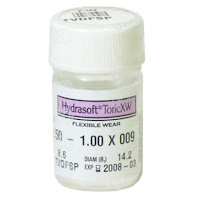 Horizon Toric: Very similar options to the Hyrdasoft Toric above, this is a yearly replacement vial lens available in multiple base curves (as steep as 8.3) and diameters (as small as 14.0). C-Vue Advanced Custom Toric: I am a huge Unilens fan; their customer service is great and almost all of their lenses are fully customizable. This lens can be made in multiple base curve and diameter options, and a huge spectrum of powers. They also have a monthly disposable silicone hydrogel lens now that offers some of the best oxygen delivery of special-order toric lenses on the market. And even though these are custom lenses, the wait time is about the same as ordering RGPs from your lab of choice. Just remember, it is a fully customizable lens so expect to pay a premium for a product with this kind of versatility. I am a HUGE Unilens fan because they offer customizable lenses in higher oxygen materials that you can wear affordably as monthly disposable (much better safety profile than old-generation vial lenses!). SpecialEyes Custom Toric: I haven't used this lens, but the SpecialEyes company offers some of the most customizable soft lenses on the market. You can get base curves ranging from 7 to 9.5 mm and diameters as small as 12.5 mm. The lenses can be made with up to 15.00 D of cylinder and customizable to a 1 degree axis orientation. Talk about options. Drawbacks are that this is again a vial lens, making this lens less than ideal for an oxygen-compromised eye, and with this kind of customization there is definitely a price tag. For your extremely hard fits and small corneal fits, this may be the only real option.